Our corporate catered breakfast packages include everything you need for you and your team to enjoy a delicious and filling breakfast or brunch. Our best value and most popular! Omelettes prepared by your professional chef(s). 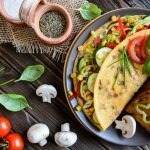 From start to finish, Mr. Omelette provides the very best breakfast catering made with the highest quality ingredients. Mixed with the freshest vegetables and creamiest cheeses, our delicious omelettes and frittatas are made from grade AA top quality eggs and are guaranteed to fill up even the hungriest of bellies. Our corporate breakfast catering packages also include a choice of crisp and delicious. Finally, bread choices include bagels and mini-muffins. Wash it all down with hot coffee, assorted tasty juices, and tea. Our professional chef will cook and serve your omelettes and frittatas. Additional wait staff is available for a fee. Additional menu items available.